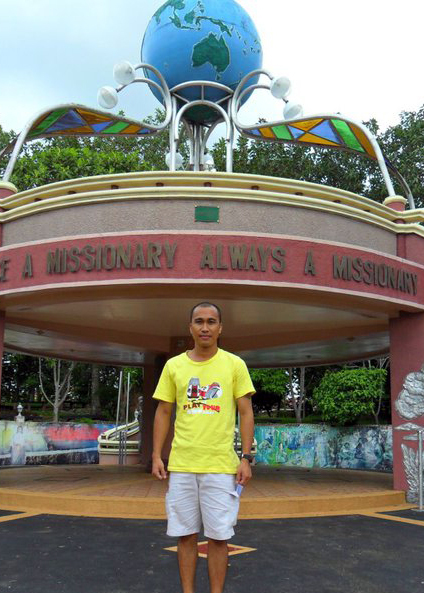 On the first few weeks of being in my mission field (Pungsan Church), I was so lonely. Everything was new to me–the place, the people, the language, the culture, food, and most of all, the weather. I had a hard time adjusting to the freezing cold. I felt so lonely, like a complete stranger in my place. But in my heart, I would always say to myself that I must be strong because I’m here to serve the Lord and I know that He is with me all the way. So I spent most of my time praying and asking the Lord for the strength to carry on. At the end of the second week, I received invitations to join the tracts distribution together with the other missionaries in SEKC (South Eastern Korean Conference) at Yeongju City. I was excited with the thought of joining, knowing that I can see my fellow missionaries and also my batch mates who are here in Korea. I prayed about it and the next day I asked my pastor and his wife if I could possibly go. They were hesitant to let me go since I was just here for barely two weeks. But because I really begged, they allowed me to go. The tracts distribution was scheduled on a Sunday morning so I headed to the terminal on that Saturday afternoon, right after the youth program in my church ended. That was around 5:30, the sun had just set and the neon lights lighted up the whole town of Pungsan. A senior missionary gave me a sketch map and instructed me to take a bus from my place to Andong bus terminal. From there, I needed to take another bus to Yeongju where they will wait for me. With that plan, I took the bus to Andong City. While I was in the bus, I had mixed feelings of excitement and worry but I kept on praying. I turned on my mp3 player and listened to gospel songs, believing that the bus will surely take me to the exact bus terminal. But after 20 minutes I was getting worried because I remembered my pastor saying that it would only take 15 minutes for the bus to take me to Andong. It had been 30 minutes since we departed and we were still on the go. My heart started pumping hard and my eyes were frantically looking outside, trying to find some English signs for me to know my location. Then he spoke with an action indicating that this place is not the terminal. When I looked around, I realized that we are at the bus’ garage. I looked at my watch and it was already 7:30 p.m. Then I asked myself what I could do. I don’t have a cellular phone and what about the people who were waiting for me at Yeongju bus terminal? I have so many questions at that point. The driver then led me to the closest bus stop, saying more Korean words that I couldn’t understand at all. I stood there at the bus stop, alone and shivering as the temperature dropped to -8 degrees Celsius. While waiting for another bus, I started to pray in my heart saying, “Lord, I know that You are there watching over me and You know where I am now…Please take me to Yeongju tonight.” Before I could say amen, the bus came and stopped right in front of me and so I climbed in and told the driver that I was going to Andong bus terminal. I also requested him to inform me should we arrive there because I didn’t know the place. The driver said “OK” and so I felt better. At that time, I told myself that the Lord really hears me. Just in time when I needed help, here came a Filipino to the rescue. We continued talking until we arrived at the terminal. Then at the terminal, the man told me to follow him so I just followed. He bought tickets for the two of us and he even led me to the bus that will take me to Yeongju. Before he left, I managed to ask his name and he said, “I’m Edwin Miranda. Okay friend, take care of yourself. Don’t worry about anything because you will not be lost. I have to go now.” So I said, “Thanks” and wanted to stop him so that I can pay for my ticket but he left. At the bus I was very thankful and felt at ease at last. Then I realized that I just saw an angel in the form of a man. It wasn’t just a coincidence. God sent him to help me and he paid for my ticket, too. Now I know that I have nothing to worry about because God is always there taking care of me. Then I remembered that God was there with Joseph in Egypt, and He was there with Daniel and his friends in Babylon, and I’m really sure that God is with me now here in Korea. That night I arrived at Yeongju Church safe and sound, and my spirit was lifted up when I saw my co-missionaries welcoming me with their big smiles. God said, “I will not leave you as orphans; I will come to you.” (John 14:18) So from that moment, I put away all my worries and fears for I know that God is with me. whahahha…ganun pla ang nangyari? sorry im soo busy taking good care of you that i couldn’t hear your story 😀 super Laughing Out Loud while reading this..nimagine jud nako ang situation~~nice!